Abuja, 15 July 2018: – The African Export-Import Bank (Afreximbank) has entered into an agreement under which the African Development Bank to provide it with a $500,000 grant from its African Private Sector Assistance (FAPA) programme to be used in supporting emerging factoring firms in Africa. The Agreement, signed at the Afreximbank Annual Meetings and 25th Anniversary Celebrations in Abuja on 13 July, is aimed at upgrading the capacity and skill-sets of up to 20 emerging factoring firms and providing advisory services to enhance the sustainability of established growth-orientated factoring firms, regulators, financial institutions and business and trade associations in Africa. Kanayo Awani, Managing Director, Intra-African Trade, signed on behalf of Afreximbank while Ebrima FAAL, Senior Director, Nigeria Country Office, signed for the African Development Bank, in the presence of Elfriede Geisler, Chargé d’Affaires, Embassy of Austria in Nigeria, and Yutaka Kikuta, Ambassador of Japan to Nigeria, who represented the FAPA donor countries. Capacity building tailored to address needs, including on-site training, provision of back-office support systems and customised manuals for marketing, credit and risk policy, finance and operations, addition to advisory services to established factoring companies and a platform to enable African factoring companies to network, exchange ideas and share best practices. Provision of project management coordination to ensure timely project implementation. 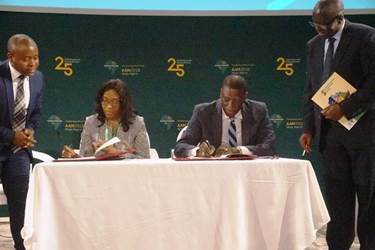 More than 100 speakers, including Heads of State, government, central bank governors, director generals of international trade organisations, business leaders, African and global trade development experts, and academics, are speaking during the four days of the Afreximbank Annual Meetings and 25th Anniversary Celebrations.